Global Smart Transportation Market is set to grow from its current market value of more than $41 billion to over $130 billion by 2024; according to a new research report by Global Market Insights, Inc. Increased traffic congestion, growing pollution, and high occurrences of accidents are the major factors enabling the countries to globally adopt the smart transportation system. These systems enable the integration of various smart technologies such as IoT, artificial intelligence, and smart sensors into transportation vehicles, thereby driving the market growth. The systems aid in improving the fleet & logistics management, goods & services management, driver assistance for traffic management, and automation of roadways, railways, and airways, accelerating the smart transportation adopt the smart market demand. The IoT-enabled transport services are also widely being leveraged for smart parking solutions, telematics solutions, ticket management, security and surveillance, and passenger information systems. Moreover, due to the smart city revolution, the government of various countries are investing huge funds in the smart city initiatives, which assist in developing connected vehicle technologies, smart infrastructure, and optimizing traffic patterns thereby making transport systems more efficient and reliable. For instance, in 2017, the Indian government invested USD 15 billion for the development of smart infrastructure and management services under the smart city initiative. 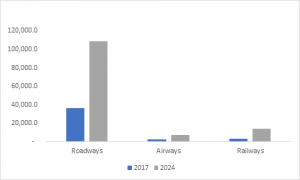 Roadways account for the highest share in the smart transportation market and are anticipated to dominate the market growing at a CAGR of 20 percent with USD 36 billion in 2017 to reach USD 108 billion by 2024. Approximately 1745.5 million metric CO2 emissions come from the transportation sector, accounting for 28 percent of total emissions globally. The adoption of smart transportation solutions, such as smart fuels and connected vehicles, helps in reducing the total carbon emissions and enhancing the environmental safety. The railway sector is expected to grow at the fastest rate over the forecast period. It carries billions of tons of freight and passengers each year, which results in the development of efficient smart rail infrastructure and technologies. The government of various countries are also taking up initiatives and implementing regulations for the development of the smart railway system. In some countries including China, the government has invested USD 28 billion in various PPP projects for implementing smart railways. Smart traffic management solutions hold the highest share in the smart transportation market with USD 9.3 billion in 2017 and are anticipated to reach USD 25.4 billion by 2024. The smart traffic management systems are inbuilt with sensors, which regulate the flow of traffic by reducing traffic congestion, pollution, and accidents, thus enhancing the smart transportation market growth. For instance, in January 2018, the China-based firm, Didi Chuxing together with Chinese traffic management authorities launched a smart city traffic management solution known as DiDi Smart Transportation Brain. This product has been adopted by more than 20 Chinese cities, facilitating the real-time data flow through AI and cloud computing technologies, improving the transportation infrastructure including the measurement of traffic flow, smart traffic signaling, and traffic management. North America is projected to dominate the smart transportation market by 2024 due to rapid deployment of smart transportation solutions, which offer features such as real-time traffic information, parking assistance, adaptive traffic signal control, electronic toll collection, and real-time information for public transit systems. The companies operating in the smart transportation market are investing in research and development strategies aimed at new product developments. These products assist in improving transport efficiency by providing traffic control, parking assistance & management, and electronic toll collection solutions. 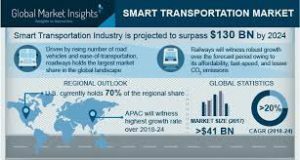 Some of the players operating in the smart transportation market include Accenture PLC, Cisco Systems, Inc., Cubic Corporation, General Electric Company, IBM Corporation, Siemens AG, Thales Group, and WS Atkins.